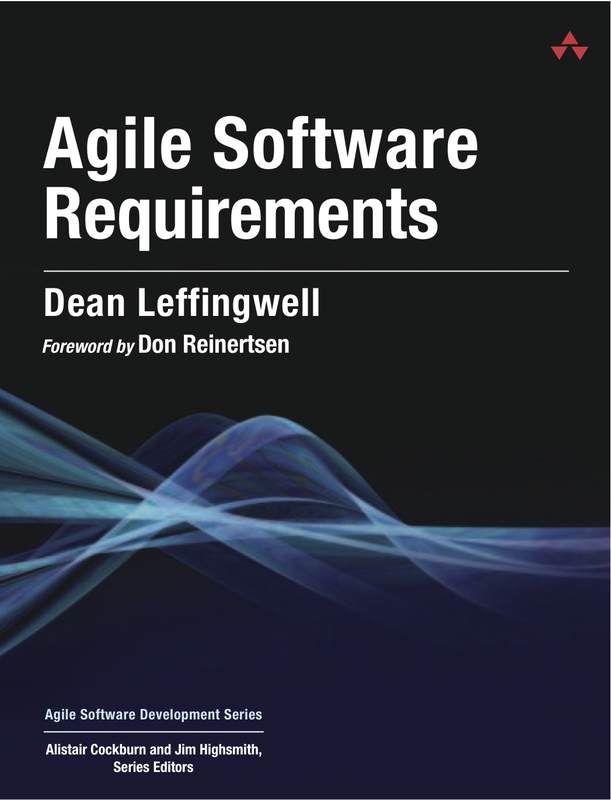 Agile Software Requirements: We Have a Foreword and a Cover – Can a Book be Far Behind? I’m extremely happy to announce that Don Reinertsen (author: Principles of Product Development Flow and Managing the Design Factory) has provided a foreword to my new book. Don’s works have had a heavy influence on my thinking, and if you haven’t read them, I’d recommend that you do. “Why do product development projects miss their economic objectives? Studies show that 80–85 percent of project failures are due to incorrect requirements. Experienced developers know that managing requirements is a greater challenge than technical execution. And, although we have known this for decades, we really haven’t gotten much better at it. Why? At first, we were functionally organized, so we simply displaced the problem outside the boundary of engineering — we blamed marketing and product management. Later, as we adopted cross-functional teams, we told these teams to listen to the voice of the customer and assumed that this would solve the problem. It didn’t. We never challenged the idea that it was feasible to develop valid requirements up-front—we just told people to try harder. We just told them to pay more attention to what the customer was asking for. We ignored the fact that many customers don’t know what they want. We ignored that fact that even when they know what they want, they can’t describe it. We ignored the fact that even when they can describe it, they often described a proposed solution rather than the real need. For example, customers told us that they wanted suitcases that were easy to carry, and asked us to make them lightweight. We did this, but they rejected our elegant designs and bought the heavier designs of our competitors – the ones with wheels on them! You may also note that it will appear in Cockburn and Highsmith’s Agile Software Development Series. (Alistair contributed to the Use Case Chapter). My Addison-Wesley editor Chris Guzikowksi, tells me it should be on the bookshelves by November. Pre-order should be available on Amazon in 3-4 weeks. (I think I’ll order some as Christmas gifts for my kids). And in a few weeks time, we should have a Rough Cut of the book available for purchase online (in the Safari platform).